This book brings together key contributions of recent years, in addition to some brand new pieces. The essays are introduced by a Preface in which Hollander reflects on his past work and reactions to it. Several biographical essays are included as well as an extension of the autobiographical account appearing in Collected Essays II. Of particular current relevance is a new and extensive chapter regarding Adam Smith’s often neglected arguments for government intervention to correct market failures, and his critical view of the business class as an anti-social force unless controlled. Similarly of high present-day interest is a re-examination of Karl Marx’s theory of exploitation, or the notion of profits as "embezzlement," demonstrating Marx’s effective abandonment of this perspective in the case of the small active businessman as distinct from the major joint-stock corporation. Nick Taylor, Warwick University. LSE Review of Books 27/09/2013. This collection is continued testament to Hollander's talent at bringing historiography and the work of the classics alive…. Overall, one is left with the impression that political economy matters, and that developing a dialogue between economists of different eras is no easy task, but that we can learn something about many categories and conceptions commonly used and taken-for-granted today through the creation of such debates…. [I]t is evident that here is a man who lives and breathes his life’s work in the history of economic thought. 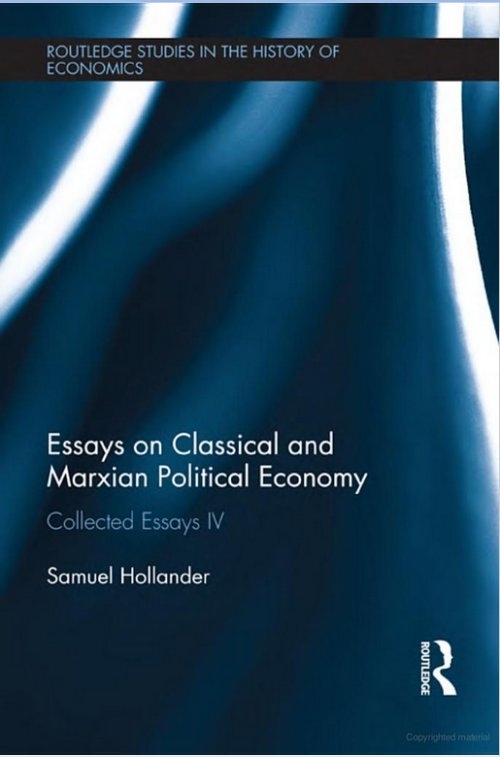 If you are interested in political economy and have some grounding in the subject matter then Hollander’s essays make for engaging, essential reading.